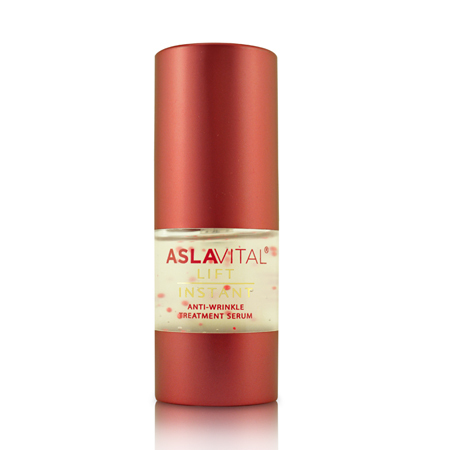 ASLLI-162 | Size: 15 ml / 0.51 fl. oz. The serum is a skin perfector and an instant wrinkle reducer. It helps erasing the traces of time. After only 1 day, wrinkles are visible reduced. After 10 days, the skin is redefined. The serum has a fluid gel texture with an innovative formula specially designed for areas most fragile around eyes, around lips and forehead. Smoothes fine lines and reduces the wrinkles. Strengthens the skin's barrier to lock in essential moisture. Improves tone and firmness, while resurfacing the skin. Gatuline Expression - Is extracted from a tropical plant and used for it's immediate capability of smoothing out wrinkles. Hyaluronic Acid - Penetrates the skin and fill the wrinkles from the inside. Has an intense moisturizing effect. Restores the skin’s water reserves and reduces the transepidermal water loss. Apply on cleansed face and neck.Associate with the daily care cream, moisturizing or nourishing. INGREDIENTS: AQUA, GLYCERIN, METHYLSILANOL MANNURONATE, ALCOHOL, ACMELLA OLERACEA EXTRACT, MEL EXTRACT, PROPYLENE GLYCOL, SOLUBLE COLLAGEN, HYDROLYZED ELASTIN, SODIUM PCA, SERINE, GLYCOGEN, PEG-40 HYDROGENATED CASTOR OIL, PHENOXYETHANOL, BENZYL ALCOHOL, POTASSIUM SORBATE, TOCOPHEROL, METHYLPARABEN, ETHYLPARABEN, PROPYLPARABEN, BUTYLPARABEN, ACRYLATES/C10-30 ALKYL ACRYLATE CROSSPOLYMER, TRIETHANOLAMINE, PEG-4, PROPANEDIOL, TOCOPHERYL ACETATE, AGAR, ALGIN, POLYSORBATE 20, SODIUM BENZOATE, CL 73360(RED 30 LAKE), GLUCONOLACTONE, CALCIUM GLUCONATE, SODIUM HYALURONATE, PERFUM, TETRASODIUM EDTA, SODIUM HYDROXIDE,SORBIC ACID, MAGNESIUM ALUMINUM SILICATE. I have used up one bottle and like it. Leave your skin soft. После стольких хороших отзывов ,решила и я попробовать. Надеюсьrnне пожалею.